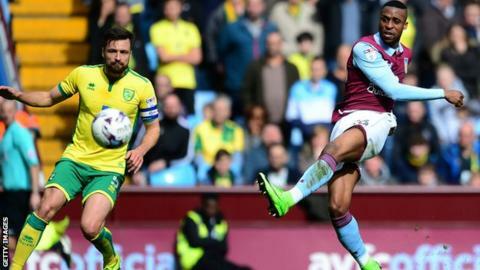 Two goals from Jonathan Kodjia saw Aston Villa beat 10-man Norwich City at Villa Park. Kodjia put the hosts ahead midway through the first half when Scott Hogan played him in and the Ivory Coast striker found the roof of the net. The game was all but settled when Ivo Pinto was shown a second yellow card for a foul on Jordan Amavi. Kodjia made sure of a home win in the 87th minute when he capitalised on a mistake in the Norwich defence. Nelson Oliveira had the visitors' best chance, just before Kodjia's second, when he was played in on goal by Cameron Jerome, but the Portuguese could not get a shot away after a poor first touch. Jerome also went close to scoring in the opening 10 minutes, but his effort went inches wide as Norwich's poor return on the road continued. The Canaries have won just one of their past 14 away league games and remain without a manager following the sacking of Alex Neil last month. Villa were denied a second before Kodjia's late goal when Nathan Baker saw his header cleared off the line by Ryan Bennett and Conor Hourihane's follow-up skimmed the crossbar. Aston Villa manager Steve Bruce told BBC WM: "We showed a little bit of resilience and my goalkeeper has played very very well today. "I thought we were a little bit leggy but we've stuck at it again and we've kept a clean sheet. "We're improving. We've still got a lot to do. We weren't great again but we've done enough to win a game of football in this division." Norwich caretaker boss Alan Irvine: "I thought we played really well for most of the game, even with 10 men. "We dominated possession, we had territorial advantage, we got into some great positions and we fell down where we would normally be at our strongest. "The last pass, the last cross in the final third, the last attempt at goal were the things that let us down." Match ends, Aston Villa 2, Norwich City 0. Second Half ends, Aston Villa 2, Norwich City 0. Attempt missed. Gary Gardner (Aston Villa) left footed shot from outside the box is high and wide to the left. Assisted by Jordan Amavi. Attempt blocked. Gary Gardner (Aston Villa) right footed shot from outside the box is blocked. Assisted by Jordan Amavi. Attempt blocked. Alex Pritchard (Norwich City) right footed shot from outside the box is blocked. Goal! Aston Villa 2, Norwich City 0. Jonathan Kodjia (Aston Villa) right footed shot from the centre of the box to the centre of the goal. Assisted by Sam Johnstone. Substitution, Aston Villa. Andre Green replaces Henri Lansbury. Alex Pritchard (Norwich City) wins a free kick on the left wing. Corner, Norwich City. Conceded by Nathan Baker. Second yellow card to Ivo Pinto (Norwich City) for a bad foul. Jordan Amavi (Aston Villa) wins a free kick in the attacking half. Attempt missed. Russell Martin (Norwich City) header from the centre of the box misses to the right. Assisted by Alex Pritchard with a cross following a corner. Corner, Norwich City. Conceded by Mile Jedinak. Attempt missed. Jonny Howson (Norwich City) right footed shot from outside the box misses to the left following a corner. Corner, Norwich City. Conceded by James Chester. Substitution, Norwich City. Nélson Oliveira replaces Alexander Tettey. Alex Pritchard (Norwich City) wins a free kick in the attacking half. Foul by Gary Gardner (Aston Villa). Attempt missed. Ryan Bennett (Norwich City) header from the centre of the box misses to the left. Assisted by Alex Pritchard with a cross following a corner. Corner, Norwich City. Conceded by Neil Taylor. Substitution, Norwich City. Yanic Wildschut replaces Jacob Murphy. Attempt missed. Jonathan Kodjia (Aston Villa) right footed shot from the centre of the box is close, but misses to the left. Assisted by Albert Adomah with a cross. Substitution, Aston Villa. Gary Gardner replaces Conor Hourihane. Corner, Norwich City. Conceded by Jordan Amavi. Attempt blocked. Cameron Jerome (Norwich City) right footed shot from the right side of the box is blocked.